Welcome to our review of the Celestron Regal M2 LER 27×80 ED Spotting Scope. This spotting scope comes with an 80mm objective lens, and is an angled-eyepiece model for easy viewing. Celestron is, of course, well known for their telescopes, but how good is their spotting scope? In this review, we put the Celestron Regal M2 LER 27×80 ED Spotting Scope through its paces and tell you how well it stands up to our testing. The caps and covers are all well made, and do an excellent job of protecting your spotting scope’s optics when not in use. The stay on case provides ample protection for the spotting scope when you’re using it, and the lens cloth is excellent quality. The T-adapter ring, which allows you to attach your camera to the spotting scope, works flawlessly and threads smoothly. 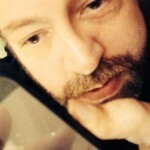 What’s the Magnification of the Regal? Magnification of the Celestron Regal M2 LER 27×80 ED Spotting Scope is 27X, allowing you to zoom in close to objects. Close focus range is 21.3 feet, so you can easily focus the spotting scope on close objects as well as those far away. The resolution and clarity of the image is just what I would expect from a leading optics manufacturer, with images appearing as natural and detailed as if the subject was mere feet away instead of several hundred yards. How Easy is the Celestron RegalSpotting Scope to Use? This spotting scope is exceptionally easy to use, with a sighting line on the lens shade to help you line up with your subject. Once you have the scope lined up, the course focus adjustment works smoothly and easily, and the fine focus allows you to get even more crispness and clarity in your image. The long eye relief, an amazing 32mm, makes the spotting scope very easy to view through, as does the perfectly angled eyepiece. What’s the Light Gathering Capability Like on the Spotting Scope? Light gathering is where Celestron typically shines (pun intended), and the Celestron Regal M2 LER 27×80 ED Spotting Scope is no exception. The optics transmit light very well, allowing you to use the spotting scope during extreme low light conditions. I’ve even used this spotting scope for stargazing when I didn’t feel like setting up my telescope, and find it to be an excellent tool for viewing the moon and bright stars or planets. How Are the Optics and Focus on This Spotting Scope? 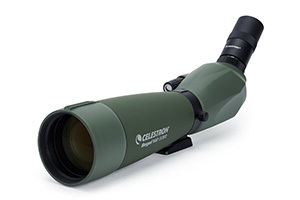 The Celestron Regal Spotting Scope uses BaK–4 prism glass, and has fully multi-coated optics, so every air-to-glass surface of the optics are protected by multiple layers of coating to increase light transmission. The body of the spotting scope is waterproof and nitrogen-filled, so there is no worry about fogging with this spotting scope. Focus is accomplished in two stages: course focus and fine focus. Both mechanisms rotate smoothly, allowing you to get your subject perfectly into focus without any problems. Once focused, the knobs have just enough resistance to prevent you from accidentally adjusting the target out of focus. What’s the Housing Like on the Spotting Scope? The body of the Celestron Regal M2 LER 27×80 ED Spotting Scope is made from strong and durable magnesium alloy, and the spotting scope features a stay-on case that protects it from bumps and scrapes. How Durable is the Celestron Regal M2 LER 27×80 ED Spotting Scope? The Celestron Regal Scope is very durable. The stay-on case protects the spotting scope in case you drop it or scrape it against something, and the entire assembly is nitrogen-purged to prevent fogging. There are also O-rings sealing the lenses, so the spotting scope is completely waterproof. I’ve been caught out in several downpours while using this spotting scope, and never experienced any water damage to the unit. Thanks for reading my review of the Celestron Regal M2 LER 27x80 ED Spotting Scope. This spotting scope may be expensive, but it is well worth the investment. It provides stunning magnification and clarity of image, and operates flawlessly in every weather condition Ohio can throw at it.